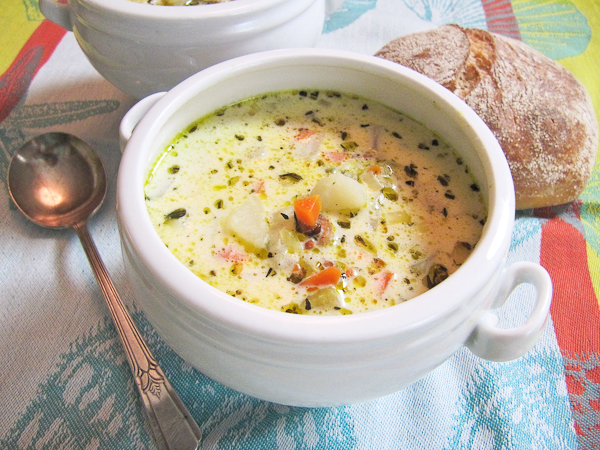 A winning clam chowder recipe with a flavorful twist from herbs de Provence. Featured on Huffington Post’s Kitchen Daily’s article on New England Clam Chowder: What’s the Best Recipe? One drizzly afternoon in December I joined several bloggers from OC Family and the Orange County Register at the Someone Cares Soup Kitchen in Costa Mesa. We were there to volunteer and learn about how this neighborhood soup kitchen has supported their community and share the inspiration of one woman, Merle Hatleberg, who, in 1986 made her first “pot of soup” to feed about 30 people and has since grown to serve over 400 folks a daily hot, nourishing meal. Then as now, many of these hungry people were families with school aged children. Even in these hard times, December is a huge month for giving and we were helping to spread the word about the “$50K in 50 Days” campaign created by Corey Donaldson to provide backpacks filled with basic essentials, toys for a 1,000 children, and a holiday dinner with all the trimmings for 1,200 people. Since then the soup kitchen has undergone a remodel with the help of donated time of local contractors and thousands of dollars from generous donors. Last Sunday, I stopped by to chat and pick up their new book of recipes which was at print in December. For centuries soups have fed the souls and bodies of those that are homeless and hungry and the SCSK contains recipes from their community of supporters. Plus, once I heard that the soup kitchen’s own Chef Lorrie’s New England Clam Chowder won first place in the Annual San Clemente Seafest 2010 Chowder Cookoff, I knew it would be the perfect recipe to share. My ulterior motive also being to urge you to find a soup kitchen in your area to support. And if you live in Orange County, to spare the cost of a few lattes to help feed the hungry at Someone Cares Soup Kitchen or the Rescue Mission in Santa Ana. Need continues after the holidays and throughout the year. 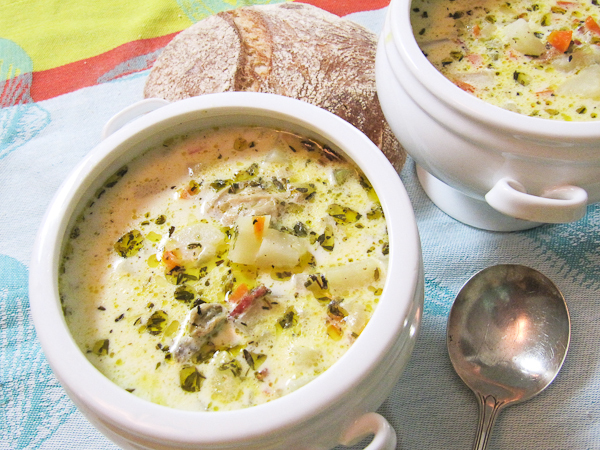 A lighter, brothy version of traditional New England Clam Chowder with a delightful flavor twist from Herbs de Provence. Cook bacon strips over med-high heat, until browned and crisp. Drain all but 1 tablespoon of the bacon drippings. Add butter and sauté onion for about 2 minutes. Add the garlic, stir and cook for another minute. Add the celery and carrots and sauté for 5 minutes. Add water and herbs and simmer for 30 minutes until potatoes are tender. Add clams and half and half and simmer for ten more minutes. *I used half and half instead of heavy cream out of preference for a lighter, brothy soup and three strips of applewood smoked bacon. Chopping the dried herbs de Provence with the fresh parsley enlivens the flavors. Meals are served Monday through Friday from 1:00 – 4:00 p.m. and a pancake breakfast is served every Saturday and Sunday mornings. The after school tutoring program began in October, 2001 and currently offers tutoring to 45 children in grades K-3. With a full-time staff of three school teachers, each student receives four hours of individual instruction. Open Monday – Thursday from 2:30 to 6:00 p.m. Giving back to the community is a great idea, and I’ve always wanted to volunteer at a soup kitchen. I will have to look into places in my area. As a New Englander, I can also say that even though that recipe is from a Cali girl, it definitely looks like something we would love to eat here, so bravo to her, and to you for sharing it/volunteering. Wow!! How great does this look?! Perfect for the cold weather!! It’s so important to remember to support our soup kitchens…thanks so much for helping to raise awareness, Priscilla! And by the way, your chowder looks really incredible! Oh my goodness, that chowder looks amazingly delicious! Love the color and the photos! A wonderful, wonderful post, so lovely that you spent an afternoon helping out at the soup kitchen. That is one lovely-looking clam chowder (or “chowdah” around these parts!). Really wonderful to help out in the soup kitchen! And your clam chowder looks amazing, I love the bacon and the Herbs de Provence here, excellent! This clam chowder looks wowed……wowed..so is your photography. I wish I could have some now. Great looking soup! I love home-made clam chowder – even the restaurant ones tend to be too salty for my taste. I have never been to New England, but this recipe is more than welcome in my kitchen. the way this is served looks so authentic. what a great recipe and your pictures are irresistible! Thank you for this recipe – that soup looks ammmmazing! My husband is going to fall in love with me all over again once I make it! I’m a real Soup lover…especially the substantial ones like this clam chowder. By the reading of the ingredients…it does look extremely promising. Book marked! Here in Montreal…we do have a few soup kitchens which have been increasing demand and it becomes more evident where society is in more need than most people realize. Great of you to have brought it up Priscilla. Great cause. I’m sure the need is greater than ever too. What a hearty soup, love clam chowder haven’t had it in so long. Beautiful clam chowder and a wonderful cause. Believe it or not I dream about helping in causes like this and I need to just make the time. I think it’s great for you to raise awareness this way–I hope funds continue to come in to support causes like this. Wow. This was such a pleasure to read. Good soup, even better cause! I volunteered with the homeless in high school, and I had such a great experience. I need to find a soup kitchen here in Austin! I love that they do after school tutoring too. Thanks for always making me smile with your words, photos and recipes. I hope that your Wednesday is full of joy! The recipe sounds great; however, there is nowhere in the instructions as to when to add the clams. I have never made clam chowder before so I have no idea as to when they should be added…. Hi George! Thanks for bringing that to my attention. You add the clams at the end, they get tough if cooked too long.